Washington, D.C. – Consumer interest in purchasing an electric vehicle (EVs) has increased in the past year, and this interest is greatest among young adults. That’s according to the Consumer Federation of America’s second annual survey on EVs. CFA also found that the number of EV choices on the market is increasing, while electric vehicle prices are becoming competitive with gas-powered vehicles. Overall, sales of EVs have significantly outpaced the sales of hybrids in their first years on the market. Currently, 2016 sales of EVs are on track to outpace 2015. For the second year, CFA commissioned ORC International to conduct a national survey on consumer attitudes toward EVs. A representative sample of 1,007 adult Americans was surveyed by cell phone and landline in late August. The survey’s margin of error is plus or minus three percentage points. The survey revealed growing interest in purchasing an electric vehicle, rising from 31 percent in 2015 to 36 percent in 2016. Among different age groups, young adults (18-34) are most interested, with a full 50 percent saying they would consider buying an electric vehicle. The more consumers say they know about EVs, the greater their interest in purchasing one. Among survey respondents who consider themselves very knowledgeable about electric vehicles, 55 percent are interested in buying an EV. Among those who say they have no knowledge of EVs, only 22 percent are interested in buying one. The survey also asked consumers, “The next time you buy or lease a car, would you consider an electric vehicle if it costs the same as a gas-powered car, has lower operating and maintenance costs, has a 200 mile range between charges, and can recharge in less than an hour?” In response to this question, 57 percent said they would be interested in purchasing this EV. 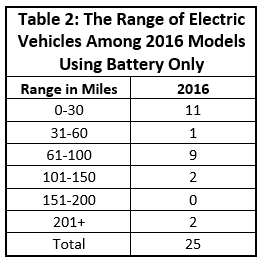 For those who say they know a lot about EVs, the figure was 62 percent. And for young adults, the figure was 70 percent. This survey question approximates the kind of vehicle that is expected to be available for consumer purchase in the very near future. The upcoming Chevrolet Bolt ($30,000) and Tesla Model 3 ($27,500) are expected to arrive on the market in 2017, and will match the criteria outlined in the question, with charging estimates via DC Fast Charge of one to two hours. Because research demonstrates a correlation of interest in EVs with knowledge of EVs, CFA has updated its EV guide in order to improve consumer understanding of EVs. The Car Book’s Snapshot Guide to Electric Vehicles is available for free on the ConsumerFed.org website. “Our goal is to expose the public to the options available, and thereby increase interest in learning more about electric vehicles. With batteries becoming more efficient, an increasing number of choices entering the market, and prices becoming more affordable, there is no question that EVs are poised to disrupt the automotive marketplace,” said Gillis. The Snapshot Guide to Electric Vehicles provides an overview of the key features of 2017 model EVs, allowing consumers to readily compare the mileage, range, and charging types available among new models. The guide is designed to improve consumer knowledge and understanding of EVs, while providing a comparative road map to the choices available for 2016. 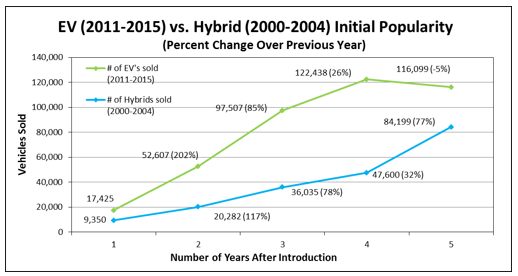 Introduced in 2000, the sales of hybrid vehicles (vehicles with dual power sources, typically electric and gas) have increased significantly since their introduction. Today, every manufacturer except Mazda offers a number of hybrid options in a variety of vehicle sizes. As the chart below shows, during their first four years, sales of EVs have outpaced the now popular hybrids. “Consumers understand that low gas prices will not last forever, and these early adoption numbers for electric vehicles signal significant future growth in the market,” said Dr. Mark Cooper, CFA’s Director of Research. While lower gas prices may have dampened EV sales a bit in 2015, carmakers have increased their efforts to offer new, longer-range, and lower-priced EVs. This year, 13 car companies offer at least one electric option. Volkswagen is offering four models, while Ford, BMW, and Mercedes-Benz each offer three models. Of the major automakers, only Honda, Subaru, and Mazda do not currently offer an EV option. As both carmakers and their suppliers make large investments in battery technology, there will be a record number of new models introduced in 2017. 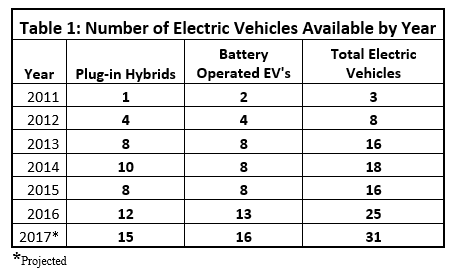 Table 1 shows a near steady increase in the number of EVs being offered over the past 6 years. Just six years ago there were only three EVs on the market. By 2016, there were 25 models on the market. Based on manufacturer projections, 33 different models should be available in 2017. Between BMW, Chevrolet, Hyundai, Mercedes-Benz, Tesla, and Volvo, six all-new EVs will be added including the much-anticipated Tesla Model 3, which already has over 400,000 pre-orders. The number of pre-orders for the new Tesla is higher than for any other car ever introduced. In 2016, it is expected that Americans will buy over 17.1 million cars and light trucks,  with an average price of $33,560. Today’s EVs have become price competitive. 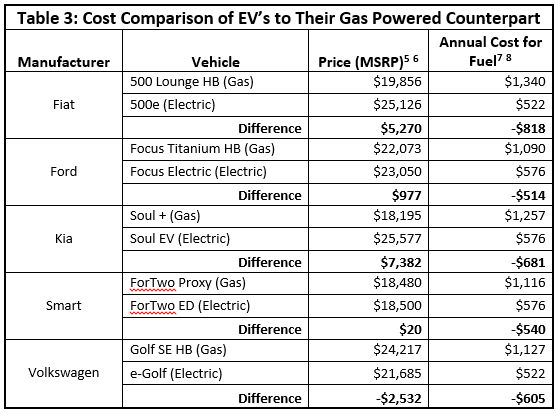 While EVs do vary widely in price – from $23,000 for a Mitsubishi i-MiEV to over $136,000 for a BMW i8 – there are a number of vehicles whose prices are similar to those of the gas-powered version of the cars (see Table 3). In looking at the typical cost of an electric vehicle, we conducted a one-to-one comparison for those EVs with a gas-powered version of the same vehicle. While some manufacturers, including Fiat and Kia, do charge significantly more for their EVs, others – including Ford, Smart and Volkswagen – have priced electric and gas-powered versions of the same model similarly. To compare the costs between EVs and their gas powered counterparts, we considered the $7,500 federal tax credit currently offered, added the estimated cost of purchasing a Level 2 connection device and a 240 volt circuit for home charging. The connection charges are estimates, and could be mitigated by rebates from local utility companies or local tax credits. For example, Gulf Power in Pensacola, Florida, offers a $750 credit toward the costs of upgrading a home to accept a level 2 charger. Austin (TX) Energy will rebate 50 percent of the cost up to $1500 and many states offer tax credits. If longer charge times are acceptable, then Level 1 charging equipment comes free with the vehicle and simply plugs in to a regular electric outlet, requiring no additional investment. “While the economics of EVs are becoming attractive to consumers, their ‘high-tech’ nature will also be an important factor in future purchase decisions,” said Gillis. Includes $7,500 tax credit. Currently, the tax credit only applies to the first 200,000 vehicle models. If the credit is not changed and these pre-orders hold, then have of these people will not get the $7500 tax credit. Electric price includes $7,500 federal tax credit, typical level 2 power connector price of $600, and an estimated $750 for home installation of a 240 Volt receptacle. Based on typical driving of 15,000 miles per year.